Promote mathematical interest in children of grade 3 through grade 6 by relating the concept to the real-life situation with this batch of word problems on area of rectangles. The word problems offer two levels of difficulty; level 1 comprises word problems to find the area of rectangles and the missing parameters, while level 2 has scenarios to find the area involving unit conversions or finding the cost. 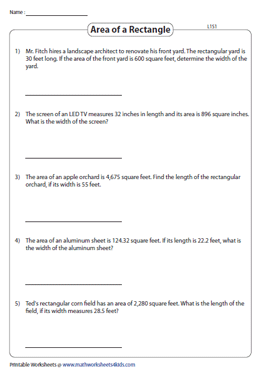 Also, included here are word problems to find the area of rectangular shapes. 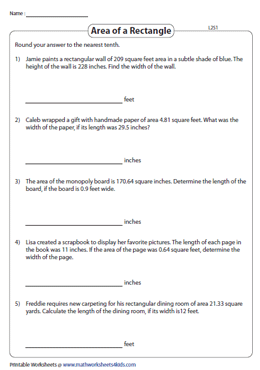 Equip children to bring together reality and math with these word problems on area of rectangles. Instruct grade 3 kids to plug in the dimensions in the formula A = length * width to compute the area. Visualize the scenario and highlight the length and width. Children are expected to convert to the specified units and then solve for the area of rectangles. Some word problems require calculating the cost. 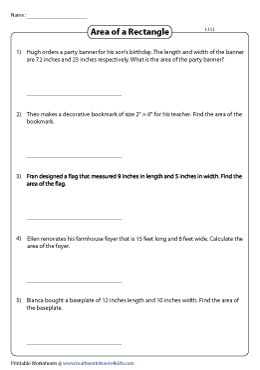 Direct fourth-grade children to figure out the area and the length or width in each word problem. Rearrange the rectangle formula, making the missing dimension the subject, substitute and solve for length or width. 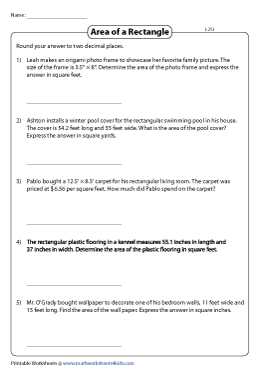 Level up with this set of worksheets for grade 5 children featuring word problems to solve for the unknown dimension using the area and the dimension given. The word problems involve either unit conversion or determining the cost. 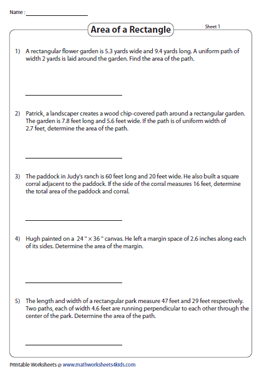 Read the scenario and draw the rectangular path, decompose the path into non-overlapping rectangles and find the area of each individual rectangle, add the areas to determine the area of the rectangular paths in this set of word problem worksheets.